The recent earthquake in Japan has made me think again about my Grandads experiences in 1908 when he was a junior rating on the HMS Sutlej. On the 28th December 1908 a massive earthquake of magnitude 7.5 hit the Messina Straits, a narrow channel that separates Sicily from southern Italy. The earthquake had a catastrophic effect at its epicentre and was followed by fires and a tsunami. 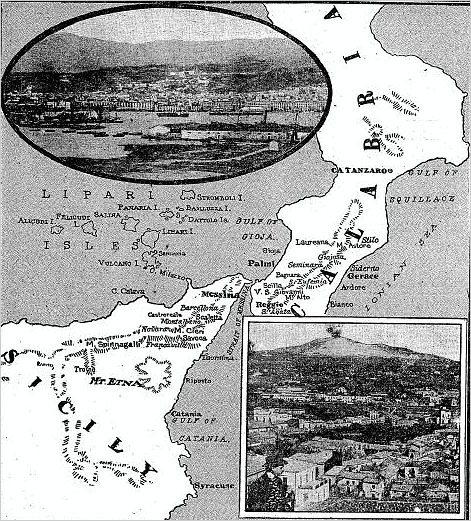 Both Messina in Sicily and Reggio Calabria in Italy were almost completely destroyed. A shocking number of people were killed, estimates vary but it may have been up to 140,000 at Messina and 45,000 at Reggio Calabria. This earthquake was almost surely the the deadliest European earthquake ever it still ranks as one of the deadliest worldwide. Many nations came to the aid of the survivors and a number of Royal Navy and British Merchant Navy vessels landed men at Messina, which was the worst affected population centre. These men including my Grandad, Herbert James Lowe, from the HMS Sutlej. He was born in 1891 so was just 17 years old when he landed to see the devastation of Messina after the earthquake. Whilst my Grandad was there he helped a young Sicialian woman have a baby. Along with many other British sailors he was awarded an honour. Family lore has it that because of his young age and the particular help he had given the frightened girl as he helped deliver her baby he was made an Honorary Count of Messina, this may or may not be true, but I have always believed it.